Hurry, Only 9 Left ! Simple, basic and minimal, yet so functional. 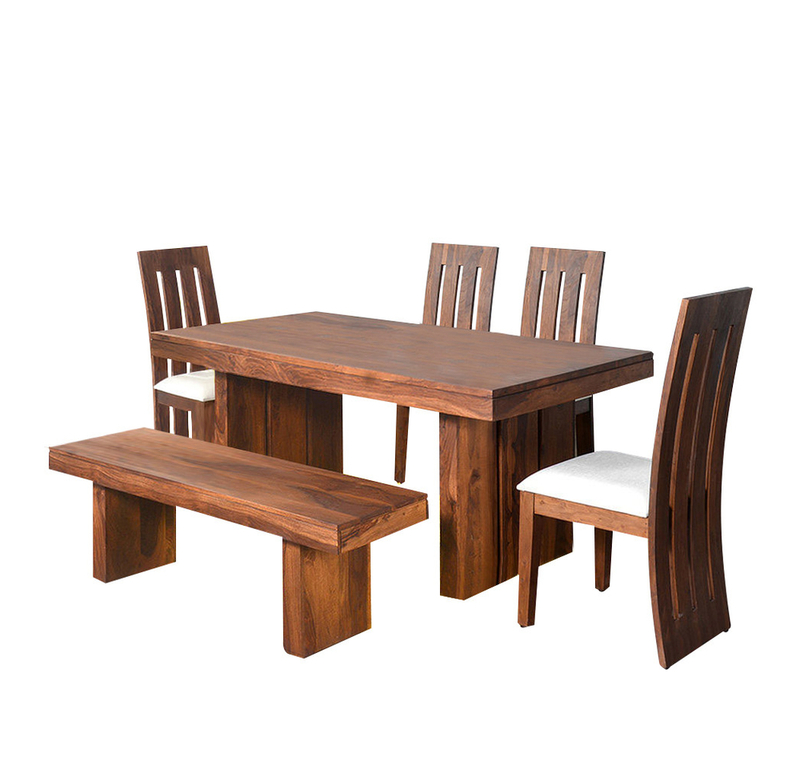 The Delmonte 1+ 4+ Bench Dining Kit is a must-have in all urban homes. Crafted from mango and Sheesham wood, it is enhanced with fabric upholstery of matching the natural colour tone. Make it a part of the dining table, and when guests arrive it can be easily transported to the living room or the balcony to make extra seating arrangement. Easy to move around and easy to blend with different kinds of décor styles, the bench has become one of the most essential pieces of furniture for any home. Sheesham Woods adds Durability and gives the Dining an Artistic look.Impeccable Design of the Dining Set with Sheesham wood Augments the Beauty of your.Cushion Padding in the Seat provides Comfort while Seating.Exclusive Tapering Profile in the Dining Chair gives it a Trendy look.Ergonomically Designed High Back Chair Provides good Support to the Spine. Avoid keeping very hot or very cold materials on the wood directly, always use coasters or mats.All Chrome Polish Must Be Clean In Every 6 month -Avoid Deco polish from direct sun rays. Avoid floor cleaning water interaction by using carpets & rugs for dining sets & coffee table.